This week has been insane! Seriously...ok well to start off we weren´t allowed to go out the 22nd because it´s a Mexican holiday and apparently in Mexico city there was a huge riot, but everything was just calm and dandy here in La Pradera so we just stayed home and planned because it was a Thursday...that means weekly planning...It was a little interesting because with all the weird area changes we had to split up our area and do our own divisions. I´m staying with Sister Durham for another change and it´s going to be awesome because we will be able to celebrate her birthday together and have Christmas with the ward and the ward members love us! haha! It´s great! I can´t believe I only have 4 changes left....CRAZY. I still feel like I´m brand new here in the mission and sometimes I feel like I still don´t know what I´m doing lol but it´s time to kick it into high speed because I don´t have much time left! It was really interesting fasting with her though because while we were fasting we were able to find and contact a lot of awesome people! Heavenly Father has literally places wonderful people in our path and I´m so grateful for this opportunity that I have to help them get to know about God´s plan for them. Cesar is another one of our investigators and has a baptismal date for the 6th of December and he is truly ready to be baptized. He was a reference from his mom and he has known the church for several years. He literally told us that nothing was going to stop him from taking this step in his life because he knows that it´s true. He´s 33 and he says that if Christ was baptized at 33 then he should do it too! He always makes us laugh and I can´t wait to see him dressed in white. He asked us if there would be an opportunity to grow in the church and develop his talents too because he really loves teaching. Sister Durham and I looked at each other and just laughted because that is EXACTLY the type of people we´re looking for! For people that want to contribute and grow in the gospel of Christ. We told him that he´d be able to have a calling in the church and that he´d be able to grow spiritually. I´m so excited for him! We also have another investigator that we contacted in the street, her name is Rosario...she is amazing and she´s been to church twice already and loves the plan of salvation. I love seeing when the investigators understand that there really is a plan and that God really does know them. I love it! Her little boy turned 2 on Saturday and we brought them little hostees cupcakes and a little candle with a 2 on it! I really love this family and I heard her other son Danet say ¨ Mom...I really loved Primary...when can we come back?¨ That was really a hilight of my week. I can´t wait to see him in a few year preaching the gospel as a missionary. On Saturday we were able to have a really great experience with the young men and young women in the stake. All the missionaries went out and we were split into groups where we were able to contact people in the streets and it´s something that as a missionary, I do everyday, but it was great seeing them sharing their testimonies with the people. I loved it. The mission isn´t easy and it definitely isn´t anything that I expected, but I´m loving every minute of it! Happy Thanksgiving everybody! Hey everybody! First off I´d like to thank everybody for all the birthday wishes, I had AN AWESOME birthday...I¨m not even kidding....There were like 6 cakes in total and lots of hugs and even confetti..we ate with Lucy and Alberto...then we went to the Pintor´s ....and then we went to pick up some pancakes that someone had made us! (We ate them this morning and they were delicious) . The young woman at church also sang a song during the 3rd hour and it was great. I had an excelent day. On the 7th we had Zone Conference and we were about 90 missionaries and we had the opportunity to listen to our mission president and we talked about how we can receive inspiration as to what we need to ask our investigators to get them thinking...they´re called ¨inspired questions.¨ We did this activity with all the missionaries and we were all in one room and the President gave us an example of a family and their certain needs and situation and then he´d pick 2 missionaries (a companionship) and ask them to sit and talk to another companionship (who were playing the role of the family) ...but as soon as the missionaries thought of what they were going to say, the President told them something else and totally changed the situation so then they were left to think of inspired questions to ask the missionaies pretending to be the family members. It was awesome to watch, but I´m sure glad my companion and I werent chosen, ha! We also did skits! It was pretty funny....we did the skit of ¨The Fourth Little Pig¨ and I like these skits because the Latinos read the lines and the people from the states act.....I was assigned the role of ¨the wolve¨ and that we pretty fun because we changed the story a little bit and I was ¨the big bad Elder Wolf¨....ya...anyways, it was pretty funny because at the end I end up getting married to my companion ¨the 4th pig¨ I had such a great time, but I´m glad it´s over lol and I´m glad we only had to do it once haha. We also had a baptism! His name is Greco and I know that I havent written much about our investigators...I could really improve on that but yeah, he was baptized on Saturday and he´s adorable...he´s 9 and he´s always like ¨Hermanas...is this like a review? Because I already know all this stuff¨ He´s been going to church for years, but his parents just gave him permission to be baptized...and they came to the baptism too! He was a little sad though because he had broken his arm 3 days beforehand and thought that he wouldnt be able to be baptized...but a little cast doesnt stop us missionaries, lol his grandma actually did it, but she was able to put his little arm in a sling and wrap everything up in plastic wrap so it wouldnt get wet. Greco is really amazing. He has his piggy bank and he´s saving up to go on a mission too! This week was amazing. We were able to have two really great activities that really made me feel like I was making a difference in the lives of these people. The first activity was on the 31st and we went to the park in Tlaltenango because they were having an activity for day of the dead and there were lots of people with their stands and a couple in the ward were able to help us with the set up, and we had a lot of success. It was amazing because we shared the phamplets ¨Mi familia¨ and ¨The Plan of Salvation¨ we also were able to explain a little bit about the restoration and the Book of Mormon. It was great because some of the people were really concerned about their deceased family members and we were able to comfort them and tell them that they´d be able to see them again. It was also really neat to see all the people dressed up in their costumes next to their day of the dead stands. The next activity that we did was singing at the retirement home. I absolutely loved this because the old people were SOOO excited to see us! I had such a great time. We sang a few songs and then we just sat and talked to them for about 30 minutes. I had the opportunity to get to know a lady ¨Berta Garcia¨ who is a doll. I absolutely love this lady. She told me that she had no husband, no children, no brothers or sisters and that she always just lived with the families whose houses she cleaned. I was so happy to be able to talk to her and get to know her a little too. We even took some pictures together, but she refused to look at the camera so she´s just looking at me...ha! but at the end I got her to make some funny faces for a pictures. I printed them out and I can´t wait to be able to give it to her. I´m not sure when the ward is planning on going again, but I might just give it to one of the members who goes a little more frequently. I had discovered that activities are great ways of getting people involved and getting people to trust the missionaries. We´re thinking about doing an activity up in the area of Monte Casino by the family group because apparently there are a decent number of inactive people that live in that area. We were thinking of getting a list of the people that live up there and getting a small group of ward members to go up with us to give these people a visit. I´m not sure when this would be, but I hope that whenever we do it that it´ll be successful. We´re also planning a family home evening with the ward to try to get everyone a little bit more involved because some of the members don´t really know the other memebers that well. We´re also trying to get the Bishop a little more involved too because we never see him unless it´s Sunday. I think maybe his family could use some love from the missionaries, just to let him know that we care about him and the ward. We have a few baptizms coming up Greco (on the 8th) and Lucy (on the 15th). Greco is a 9 year old who is hilarious. He has gone to church for the majority of his life, and his dad recently gave him permission to get baptized!! He always makes us laugh ¨ummm hermanas....esto es como un repaso verdad? porque....bueno, ya me lo sé todo!¨ He is such a sweet boy. Lucy is amazing as well. I´m not sure if you remember Alberto? He was the one with whom we shared the talk ¨The Blueprint of God´s church,¨...well, he didn´t progress as we would have liked, but hopefully he´ll see the need to get baptized after the baptizm of his mother, Lucy! Haha! He isn´t too interested for the moment, but that didn´t stop us from getting to his mom! She´s currently fighting against the desire to drink coffee...your prayers for Lucy would greatly be appreciated! I can´t believe I´m turning 21 on Sunday you guys, this is crazy!! Yesterday we had 4 less active members at church and it was awesome. We´re working hard on trying to reactive them so that they can receive the fullness of the gospel in their lives. One of the less active members is Moises and he´s awesome. He served a mission but then met someone who wasn´t a member and since then he´s stopped going to church. It´s sad because he has 2 little kids who really could use the Primary in their lives. But the amazing thing is that his brother Cesar is listening to the mission lessons for the 4th time (he listened to them 3 times a few years ago) and he says he´s ready to be baptized because he´s 33 and Jesus was 33 when he was baptized! HAHA! I love this family. The mom is really cool too, she know just how to talk to her kids ...she told Moises ¨hey ...your brother is listening to the missionary lessons and has a baptismal date...and he wants you to baptize him...but you can´t...because your inactive...¨ HAHA! But then Moises got all excited and told her ¨wait just a second...I´m going to go talk to the Bishop¨ and yesterday the mom and bother of her sons were at church. I love the gospel. Alberto didn´t progress how we would have hoped..it´s sort of sad, but his mom Lucy is amazing. She has a baptizmal date for the 15th and she basically fought one of the relief society ladies for the missionary food calendar so that she could feed us on my birthday! I love her! ( Oh yeah I almost forgot...if anyone is going to send anything to the mission home REMEMBER to put a sticker of the Virgin Mary on it or a picture of Jesus because Mexico is a little shady right now with all the problems going on--I don´t know if it´s made the news of not but there were 43 college kids who were kidnapped and the parents have been rioting and there have been a bunch of things going on, but I can´t really write about them in a blog so we´ll have to talk after the mission, but anyways, it´s pretty fishy right now. 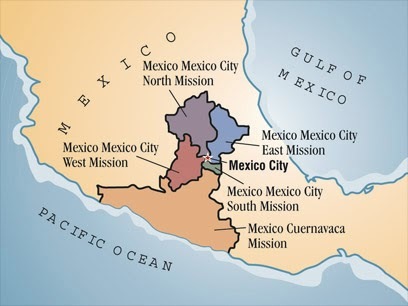 All the missionaries have been taken out of the state of Guerrero and they are still here with us in Morelos, it´s pretty crazy, but all of this is definitely an adventure. We received a reference from one of the members in the ward and we contacted his friend over the phone and he was really nice and gave us really good directions to his house and when we went, we found out that he just wanted to sell us his herbal teas! What!? We got so lost trying to get to his house and he wasn´t interested at all, haha. Apparently the member who gave us the reference is one of his clients and there was a miscommunication. We tried to share him about the Restoration but he was sort of really deaf......so we just ended up shouting it and even then he couldnt understand lol but it´s okay...I´m sure he´ll run into the missionaries later in his life. This week was really hard, I´m not going to lie. We tried everything we possibly could to get our investigators to go to church on Sunday and only one person showed up. We also went to the baptismal service of the Elders with whom we share the chapel because they wanted my companion to sing...she has the voice of an angel, not lying. Sister Durham has an amazing talent for singing. Anyways, none of our investigators came to the baptism either! Ugh! It´s okay though because everynight I just think ¨well at least there´s tomorrow¨ and we just get up and keep plowing on along. I´ve never realized just how much faith a mission would require. We were going to have transfers this week but there have been a few security problems here in Mexico recently. There has been a lot of crime in the state of Guerreo, mainly the cities of Igual and Chilpancingo (where I spent 8 months at the beginning of the mission) and the missionaries havent been allowed to leave their houses for a few days now. I´m sure everything will be fine, but I´m also sure that our mission president and his wife must be really worried and concerned so send them your prayers so that they know what to do with all of us, haha! I´ve been in Cuernavaca for awhile now though so I´m far away for those cities. I can´t believe we´re halfway though October! I hope everyone is getting ready for Halloween, the best holiday ever! This week has been great and sort of confusing too...to start off...last week I got on the bus and sat next to this old man and I started talking to him thinking that he could speak Spanish...I quickly found out he didn´t speak Spanish so I tried speaking to him in English...and that didn´t work either...so we spoke in Spanish the little bit that we could and I all that I could get out of him was that he was Russian and he was a professor at the University down the street! What?! I´ve never been put in the situation...not being able to share the gospel with someone...I wished in that moment that I could speak Russian...but I´ll work on one language at a time. We also ate with the Patriarch because he´s in our ward. He is amazing and I really like talking to him. He´s this older man who basically remembers everything he´s ever read and him and his wife love to give us food! I´m okay with that though :P It was an awesome experience because it was my turn to share the spiritual thought and I shared 2 Nephi2:24 ¨But behold, all things have been done in the wisdom of him who knoweth all things.¨ It was great because after sharing this small simple scripture he told us all that he could sense the goodness of our spirits...of the 4 of us that were there and it was just a really awesome experience. Oh, before I forget...okay so the missionaries that were taken out of the state of Guerrero are no longer ¨visitors¨ but are going to stay here...the state of Guerrero has been temporarily closed for missionary work because of all the uncertainty ...so the mission is basically ¨ the Mexico, Morelos and a little part of Oaxaca Mission¨...I bet that some day we´re going to the have a temple here in the state of Morelos...the zone has been split too! Right now I´m in the Cuernavaca North Zone. Our area ¨La Pradera¨ has been split again too...instead of just having ¨La Pradera A¨ and ¨La Pradera B¨ we have.....¨La Pradera A, B, C, and D¨...it´s a little crazy and we´re still trying to figure our everything with the limits of our areas. At first the Bishop wanted my companion, Sister Durham and I to go up into the foresty part that´s super hidden and 45 minutes away from the house but President Kusch put a stop to that, haha! We wouldn´t have minded working up there..we would have just have had to have a different schedule seeing how it´s completely dark at 6pm. We´re definitely not going to be working in that area though because it´s unsafe and right now we´re still waiting for our Bishop to get back to us with our new limits...the 8 missionaries in the ward are completely unsure of which area is ours...so it´s a little difficult, but we´re working with what we have. After the Conference we were able to be in the room when Tomas and Edgar Pintor received the Melchizedek Priesthood. It was great seeing the Stake President give the priesthood to Tomas...and then Tomas give it to Edgar...it was amazing to see that the church is a church of constant learning and progression...we will never stop learning and there is always room for improvement. I love the priesthood and all the blessings that it has to offer. Afterwards we went to the Pintor´s house and taught them a little bit about their responsibilities now that they have the Priesthood and we also talked about food storage because they had a few questions about how to get started. This family is such a great example to me and afterwards they gave us ice cream so I love them even more! haha! This week we also saw another miracle...we were walking home last Monday and my companion was sharing some thoughts about how we could find new people to teach ...or if there were even any new people to teach and we were stopped by this man who was running up and down the hill. He stopped us and said ¨hey...what are you guys and what do you share?¨ WHAT? No one wants to talk to us first of all...and second of all no one asks about the message that we share...it was so cool. We set up an appointment with him and when we went his whole family listened to us! The annoying part was that his wife and children are from this Christian church down the road and wouldnt let him say anything..and they were preaching to us...The man´s name is Javier and he´s not sure if God exists and his wife and kids basically just wanted us there to convince Javier that God is real ...but they didn´t really let us share too much of our actual message without saying something annoying. Javier definitely has the potential to progress, but we´d have to work with him before his family even had the desire to talk to us seriously. Thanks for everything you guys, Mexico is going great for the most part, and this week was awesome because we got even more cake from some of the members who didn´t feed us last week! I love this ward and this is the last week in the transfer, so I guess we´ll see if I stay here with Sister Durham for a 4th change or if one of us gets moved out! I love the mission! 4 more transfers left! ah!! This week has been insane. Because of all the problems that are happening right now in Guerrero all of the missionaries have been taken out for a few weeks until everything calms down. We´re in a ward right now with 8 sister missionaries and it´s been crazy. Hopefully things will start to calm down in a few weeks because it´s definitely harder planning with 4 missionaries, but we´ve been able to visit a lot of less active people so that´s definitely a plus. Today we went to Xochicalco and it´s super far from our house, but we decided to go because everyone else was gonna go and it was actually super awesome. I loved it and I wish I could write more about it but I´m gonna have to wait until next week :( I love all of you guys!